Columns on Columns: Pictures all over the Joint! I was so pleased to see all the columns showing up in the geoblogosphere this week! Columnar-jointed columns that is. I added to the cacophony with shots from my field trip last week to Devils Postpile and the Owens Gorge east of the Sierra Nevada. The great collection of pictures that followed have been linked by Lockwood at Outside the Interzone. Check them out! 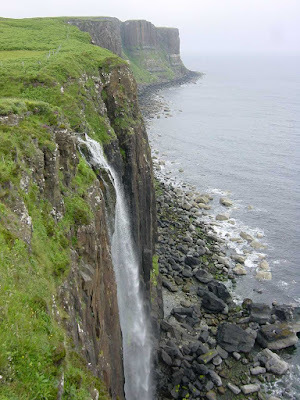 The meme reminded me of one of the greatest exposures of columns I've ever seen in my travels: they were along the east coast of the Isle of Skye in Scotland at Mealt Fall. Mealt Fall plunges over the sheer cliff and almost right into the sea. 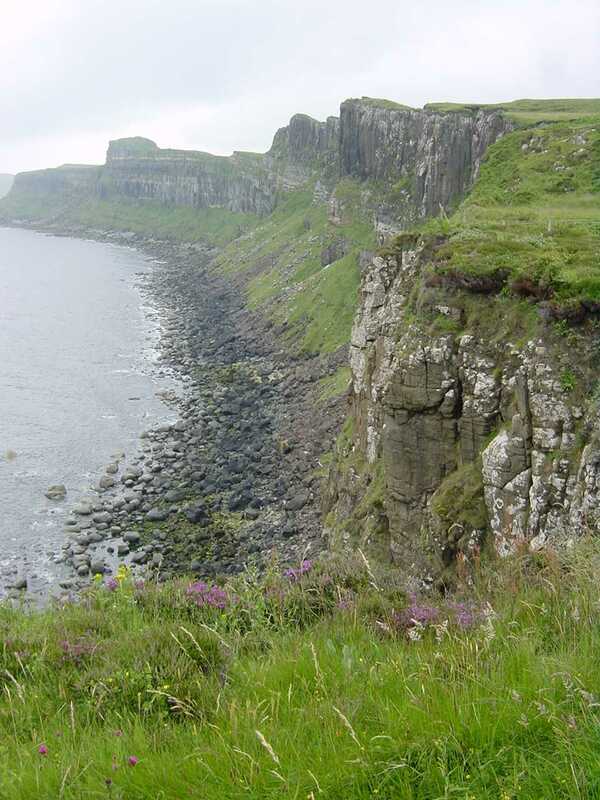 The cliffs are vertically jointed basalt flows that are related to the opening of the Atlantic Ocean in late Mesozoic and early Cenozoic time. When I got on the plane for the Scotland trip in 2001, I had taken a grand total of 3 pictures on my very first digital camera. I barely knew what I was doing, and took only a handful of high resolution shots on one of the greatest trips of my life. I wish I could do the whole trip again, though, with the camera and experience I have now (and isn't just about all of life like that?). 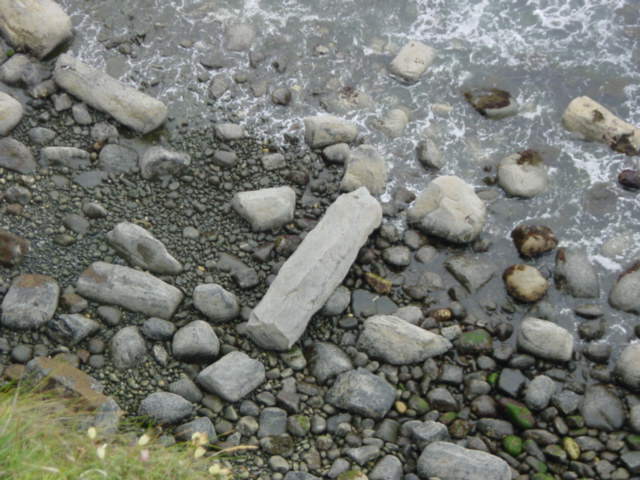 Here are some of the columns lying on the beach below the cliffs. 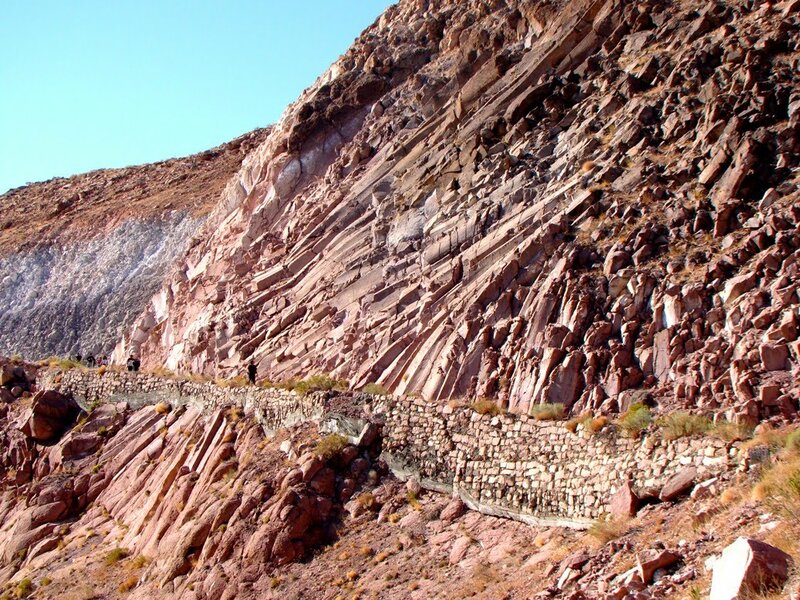 I got a note from a geology student in Argentina, Ivan Ivanyvienen, who offered up an additional photo of columnar jointing in rhyolite at the San Juan Precordillera. It's a great shot and he has given permission to show it here on Geotripper. Thanks! Lockwood should know better than to ask a bunch of geologists about their most important geological experiences. Talk about a way to get volumes written in record time! In fifty-plus years of life and 25 years of teaching, I've had a lot of experiences, and so many of them are treasured, but I suspect that many, if not most of us remember the moments when we decided to become geologists and/or teachers. I don't know how it is when one becomes a business or sociology major, whether there is a moment or a time when one becomes inspired to follow such a path, but I think a great many geologists can pick a moment. Mine was in 1976, and it happened deep in the Grand Canyon, and at a deep place in geologic time (and one of my first true insights to the vast expanse of it all). I was a gawky, thin teenager in my first year at community college. I thought vaguely about a major that would allow me to work outdoors, as a ranger or something like that, and was leaning towards biology, but those classes were full, so I enrolled in an Earth Materials class that first quarter, followed by an Earth Processes class the second. 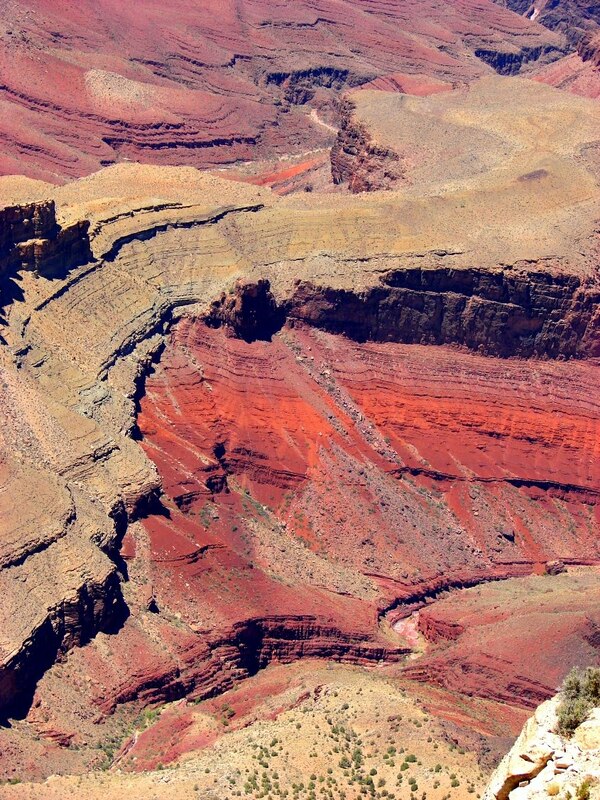 My interest was piqued, but the possibilities didn't really come real to me until I also took a field studies course that second semester: Geology of the Grand Canyon. We met every Friday for two hours, and memorized the names of the layers at the canyon, reviewed the geologic history, visited the hall of tracks at the Raymond Alf Museum at Webb School in Claremont, and took a shake-down backpack in the southern California mountains. We took the shake-down because we weren't just visiting the Grand Canyon and looking over the edge. We were going in, spending 4 or 5 days below the rim, checking out each and every one of the layers from top to bottom (and back to the top again). The trip involved a hike along some of the semi-maintained trails that are not usually a part of the tourist experience. The route down was along the New Hance Trail to the Colorado River, then along the Tonto Platform to Horseshoe Mesa, and then up the steep trail to Grandview Point. The entire journey was a revelation, as we saw the Paleozoic and Proterozoic sedimentary formations up close and personal (miles are meaningless in the canyon; when climbing out, you note what layer you've reached, not a mileage post), explored a copper mine, climbed through two limestone caverns (with ropes and helmets, no less), and even of all things, saw the aurora borealis from our camp on Horseshoe Mesa. I walked out of the canyon a geology major. One of the singular moments that has stayed with me all these years was on the first day hiking into the canyon. We stood on a high ledge at the top of the Redwall Limestone and looked across at an outcrop of the Late Proterozoic Shinumo Quartzite. That's it, in the picture above. Our instructor, Marlin, asked us why the Shinumo seemed to stick up through the younger Tapeats Sandstone. There we were, a bunch of students without a clue, tired, and frankly I never would have even looked at the outcrop, but once directed, the rocks became an incredible landscape buried in the deep past. The rocks of the Shinumo had once been an island, a 900-foot-high, miles-long island in the middle of a vast shallow sea that covered most of the western United States. It was so old that no plants or animals would have graced the slopes and cliffs. Just a few trilobites and worms squirming and burrowing about in the muds and sand in the water below. It was a stunning moment for me, to realize that we really could travel through time, reconstructing past worlds, and understanding the scope of change that has happened to the Earth's crust through deep time. For some reason, all the fossils, all the childhood knowledge, the book learning, none of it affected me as much as suddenly visualizing that ancient buried island. We continued down the trail, and saw many more wonderful things, but nothing that so effectively awakened a curiousity about the Earth as that moment. It is one of my most vivid geological experiences. Thanks Marlin, for the insight. The hottest place in the world for fifty years!? All of the discussion of the heat in California, and the all-time record that was set in Los Angeles today (113 degrees in late September!) brought to mind a story I read long ago when I was teaching in a different place. It involved a place that held the record as the hottest place in the world for more than 50 years (and it was where I was teaching at the time). An online discussion today with some of my former colleagues jarred my memory. The location was a few hours away from Los Angeles, and given all the writing I've done about Death Valley, the park would be a fair guess. But Death Valley is the second hottest place on the planet, based on a reading of 134 degrees in 1913. It was the hottest place in the world for only 9 years until a spot called Al 'Aziziyah, Libya recorded a sizzling 136 degrees in 1922. That record still stands. 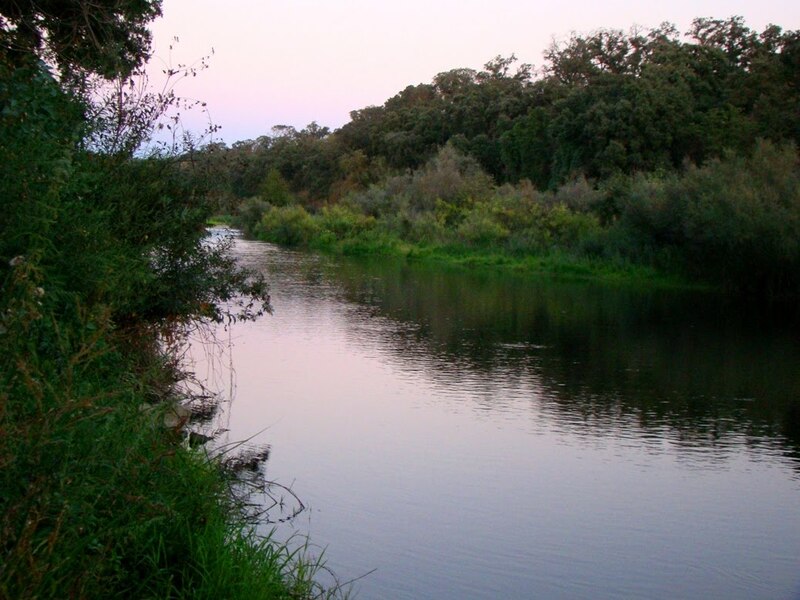 "As the sun slipped above the hills east of town on the morning of June 17, 1859, it revealed another near-perfect California day in Santa Barbara. From a cloudless, brilliant blue sky, the brassy ball of fire overhead beat down upon the tile-roofed adobes and dusty roads, quickly raising the temperature. As mid-morning passed, so did the 80-degree mark. It was nothing out of the ordinary, but that would soon change. By day's end, the small town of several thousand people would suffer through what was, at the time, the hottest temperature ever recorded on earth. As morning passed into early afternoon the heat continued. Then, from out of nowhere, a blast of superheated air blew over the Santa Ynez Mountains like a blowtorch. The sky was soon darkened by a massive dust cloud, kicked up by the blistering wind. Not long after, the heat "began taking a terrible toll on the beasts in the field," wrote the late Santa Barbara historian Walker A. Tompkins, "leaving the buzzards a feast of calves, rabbits, field mice and even full grown cattle who perished under the oak trees where they had sought respite from the punishing heat." By 2 p.m., the temperature had rocketed to an unbelievable 133 degrees! People fled to the Old Mission and Our Lady of Sorrows church in sheer terror, thinking the world was coming to an end. Others took to their adobes, desperately seeking refuge behind the earthen insulation of mud walls. "No human being could withstand such heat out of doors," says a government report later issued in 1869 by U.S. Coast Survey engineers. The survey crew happened to be on a vessel at sea in the Channel at the time, and were it not for them, an official record would not exist. Fruit shriveled and fell from trees. An entire grape crop was baked in the Goleta Valley. Birds fell out of the sky in mid-flight, their carcasses scattered over the land. Others were found drowned in the bottoms of wells where they had tried to escape the heat. Then, just as mysteriously as the wind emerged, it died. The temperature fell slightly to 122 degrees by around 5 p.m. and finally down to 77 degrees as the sun set. Santa Barbara's world record remained for 55 years (sic) until it was beat by a single degree in Death Valley. Nine years after that, in 1922, a heat wave of 136 degrees hit Libya, which remains the hottest temperature yet documented. To this day, the simoom that seared Santa Barbara in 1859 with 133-degree heat remains the third hottest temperature ever recorded on earth. There exists no comparable event in meteorological history or known Native American folklore. " That's the story I've heard. Anyone heard different? Update: As noted in the comments, it was D. E. Putnam who wrote the article. I appreciate the clarification and am glad to give credit where credit is due! 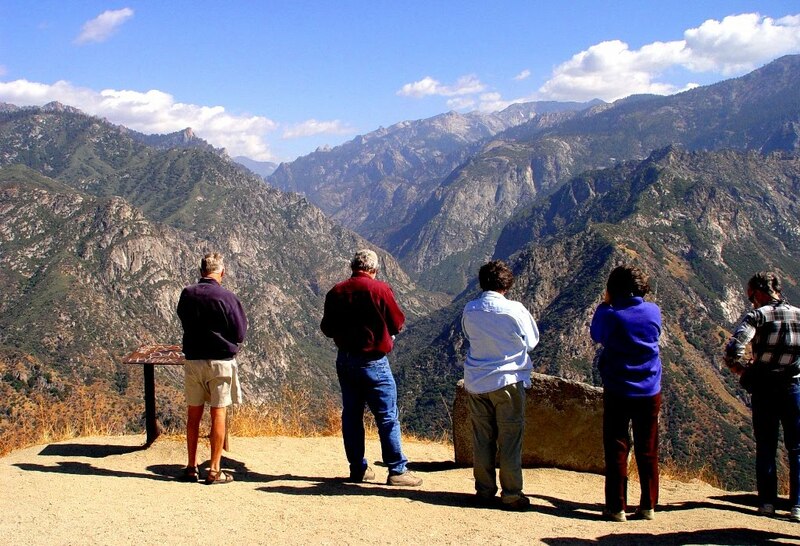 Our invitation extends to anyone who is interested in learning more about California geology. 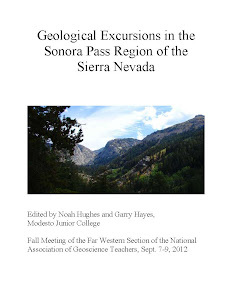 These conferences are wonderful ways to get familiar with the geology of a fascinating region, the western coast of the United States. Special discounts are offered to students, and costs are low for this kind of opportunity. We will also have a vast array of California and Nevada geology field guides and other resources available for sale. You do not need to be a member of the NAGT to participate. Information and registration forms can be accessed on the Far Western Section website. For questions and more information, please contact conference coordinator Paul Troop. 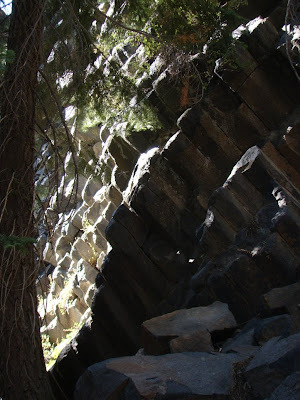 The vertical columnar joints that I saw at Devils Postpile weren't the only columns we saw on the field trip last week. 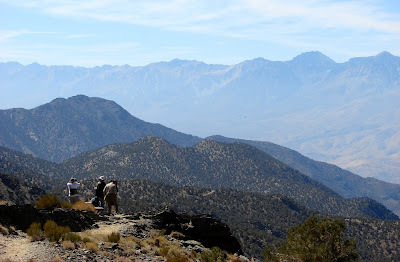 We paid a visit to the Owens River Gorge on the Volcanic Tableland north of Bishop, California. The vast mesa is a rhyolite plateau that preserves a record of the one of the greatest explosions ever to shake North America, the eruption of the Long Valley Caldera. 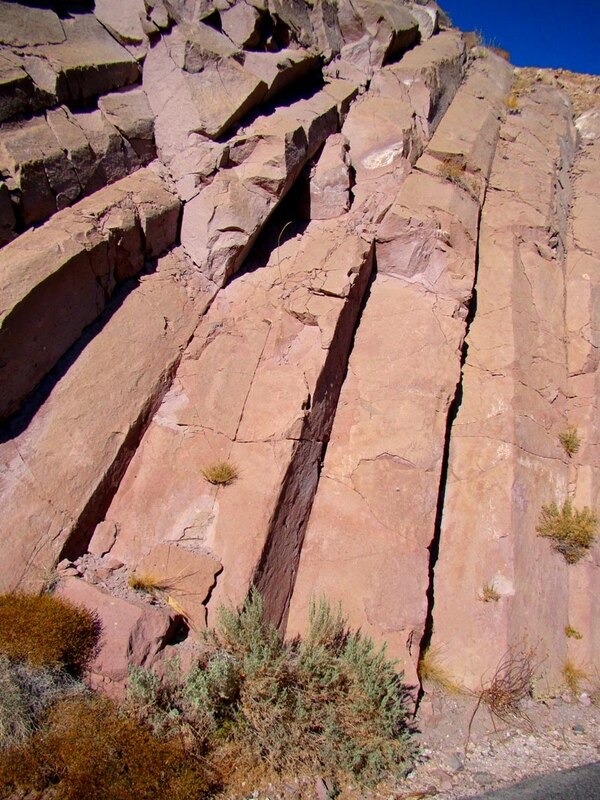 The 125 cubic miles of ash that was blasted into the sky 730,000 years ago produced the Bishop Tuff, which has been found across the western United States and as far east as Nebraska and Kansas. The giant explosion vacated a massive magma chamber, which subsequently collapsed, producing a hole two miles deep, ten miles wide, and 20 miles across. The caldera was partly filled with ash, but over the years a huge lake accumulated. When it finally spilled over the edge of the caldera, the new Owens River rapidly carved the gorge 400 feet deep. Along the way, the river exposed the columnar joints that developed as the hot ash settled, partly remelted, then cooled and contracted. They are easily accessed from one of the power station roads maintained by the Los Angeles Department of Water and Power. As I was writing about the columnar jointing at Devils Postpile National Monument, it occurred to me that I had seen a number of geoblogosphere posts that involved the phenomenon in the last couple of days. Do posts by five bloggers make it columnar jointing week? The youngest geoblogger, Sam at Geology Blues, has a note on Devils Tower. Looking for Detachment's Silver Fox posted some beautiful pictures of Deep Creek Falls in Oregon, which thunder over some basalt columns. 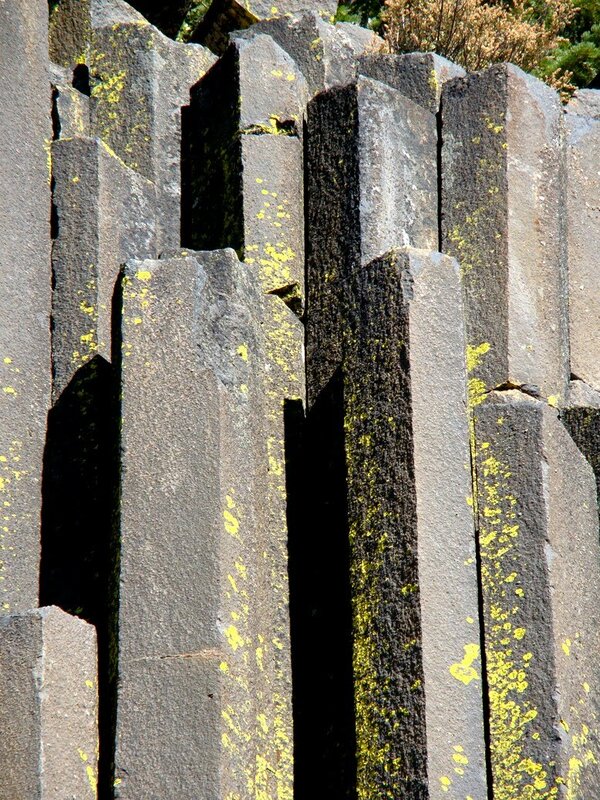 Then there were her pictures of jointing in basalt in the same general region, a Friday Mystery Photo. 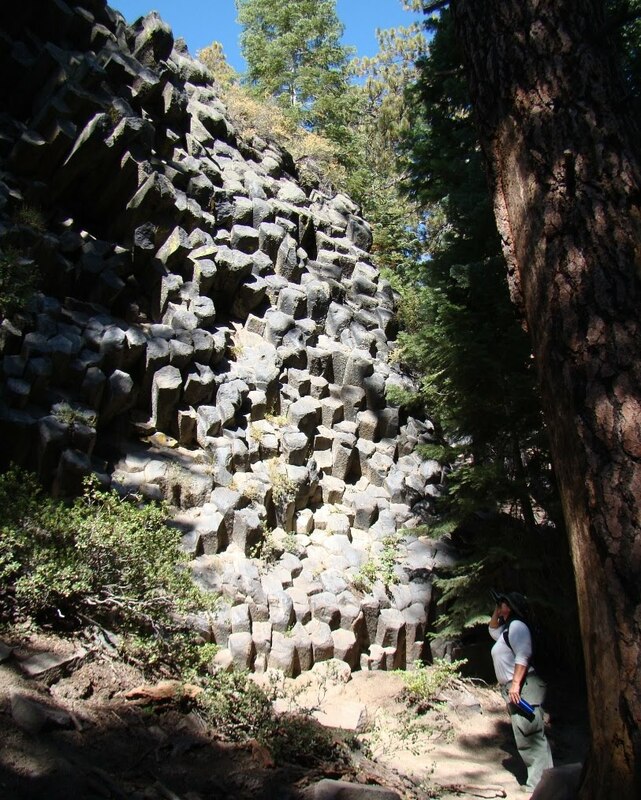 Last Thursday it was Philip at Geology Blues with a picture of columnar joints in basalts on his commute in Oregon. 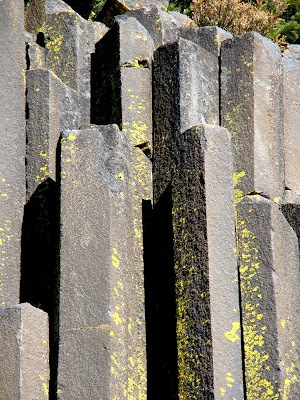 Though columnar joints aren't specifically mentioned, Glacial Till has pictures of the Columbia River Gorge and some of the basalt columns appear in the cliffs. Till writes of a new appreciation of the geology there. 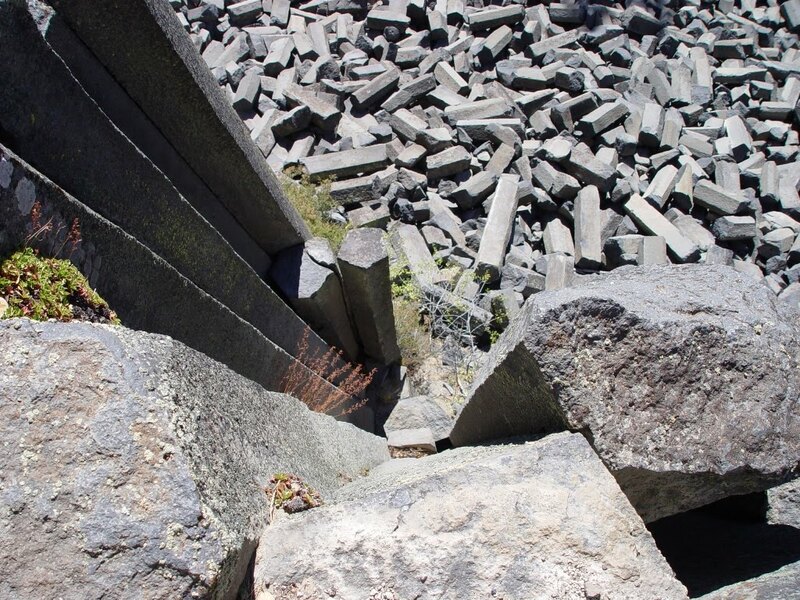 ...or the view from the top, looking down on the massive talus pile at the base. 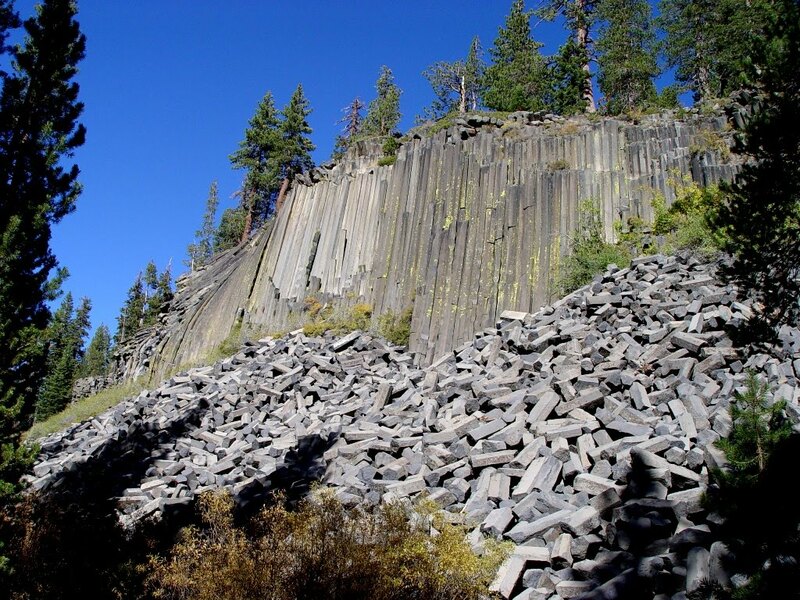 The Postpile gained monument status in 1911 after someone floated the brilliant idea of dynamiting the columns and using them to construct a dam across the adjacent San Joaquin River. Kind of like using the meadows of Yosemite to graze sheep, or strip-mining Death Valley National Park (both of which happened). 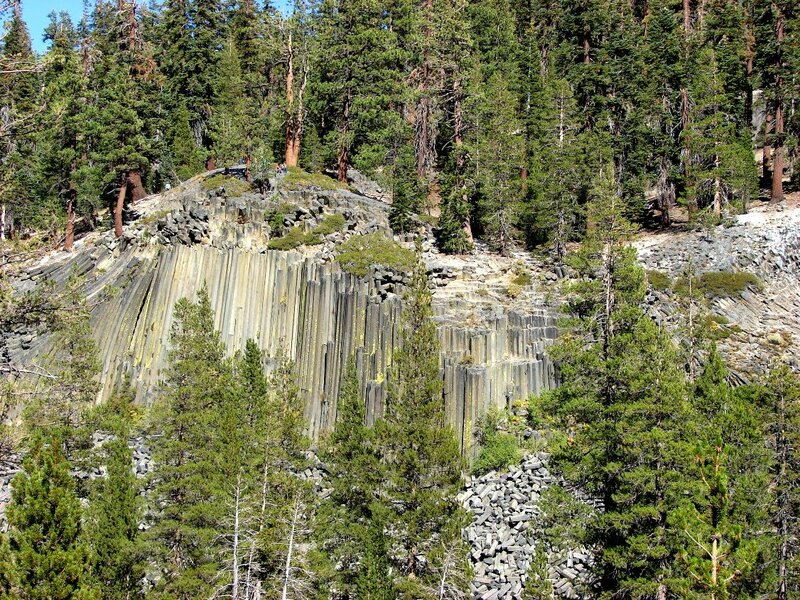 The Postpile formed when a lava flow around 100,000 years ago was dammed by glacial deposits to a depth of around 400 foot. The pool of lava took time to cool, with heat transferred to the rock below and the surface of the lava above. As the rock cooled, it contracted and cracked into the symmetrical spires that make up the cliff. The pictures I posted on Tuesday (here and here) illustrated one of the interesting angles on the Postpile that don't show up in most of the pictures in brochures and vacation pictures. 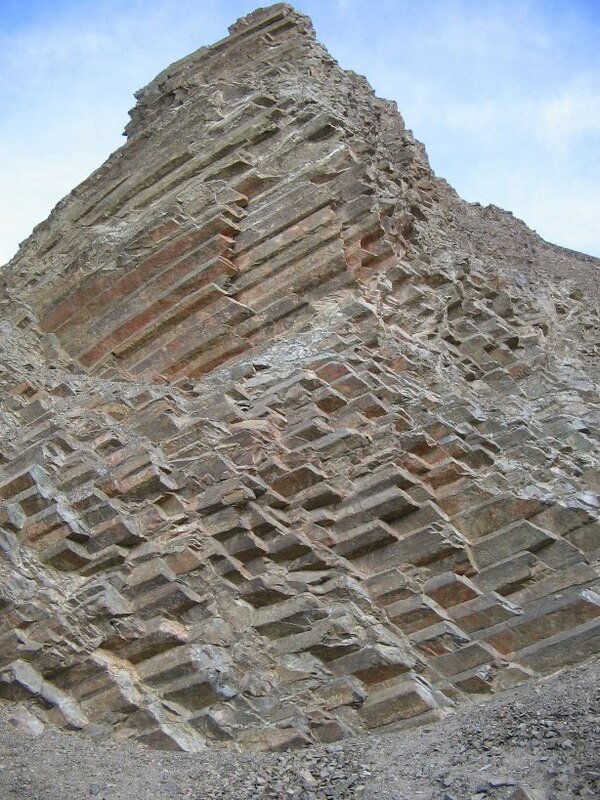 Many of the columns go off in strange diagonal directions (which is more normal in columnar jointing of most lava flows). Take a look below at a rather rarer view of the Devils Postpile from across the river (there is a trail somewhere over there, but I didn't find it. I was bushwhacking to get this shot!). Click on the picture to see a larger version (and the people sitting on the top for scale). The vertical columns are bookended by diagonal columns. Crossing the stream (it was fall; this isn't recommended in the early summer when the river runs full! 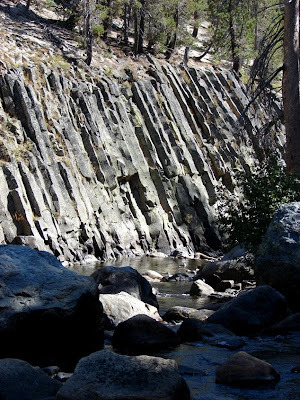 ), a series of stunning diagonal columns are exposed at river level. These are seen by a small fraction of the visitors to the monument. 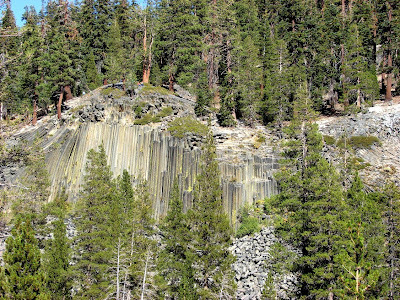 At the south end of the Postpile, the columns go in all directions (below). 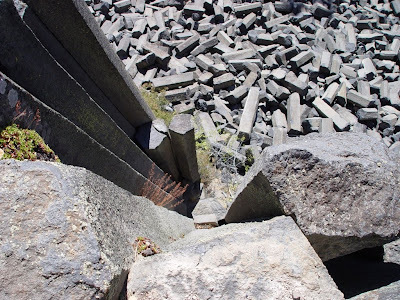 The pictures on Tuesday were taken on the flank of this side of the Postpile, where glacial plucking had broken and removed the tops of the columns rather than scouring them. Another ice age and the Devils Postpile could very well disappear entirely. 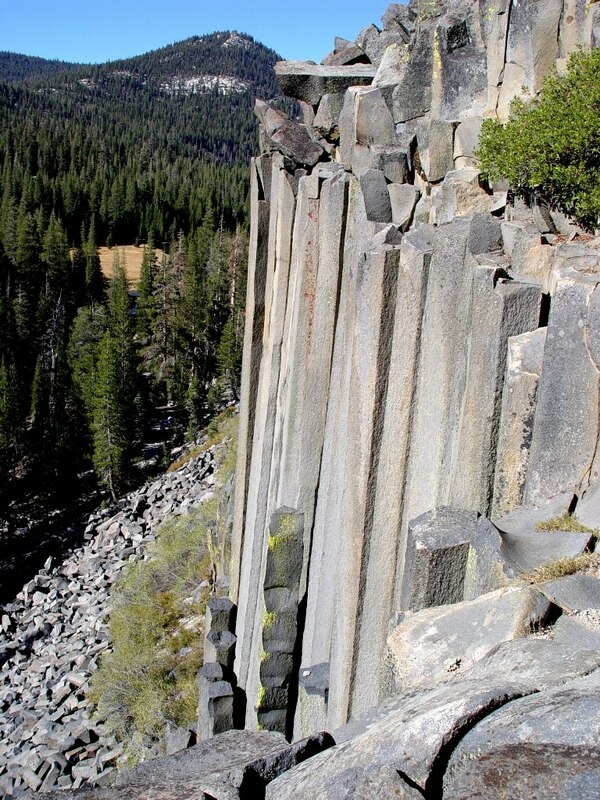 Devils Postpile National Monument is a fascinating visit for anyone interested in volcanism and glaciation. It lies over the crest of the Sierra Nevada from Mammoth Lakes along a drive that passes over Minaret Summit with a stunning (there's that word again, it comes up a lot when I explore the Sierra Nevada) view of the Minarets and Mounts Ritter and Banner, perhaps to show up in a future post. Because of limited parking and overcrowding, the park service long ago instituted a shuttle bus to ferry people from the Mammoth Mountain ski area during the summer months (including a fee). 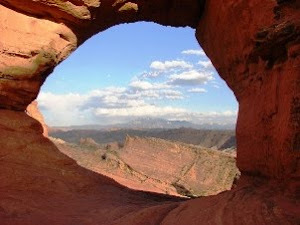 You can drive down if you have camping reservations, or in late September or October before snowstorms close the road. 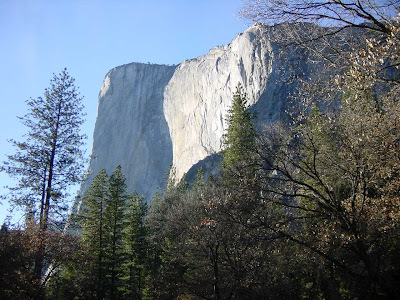 Fees are charged, but schools may be able to get fee waivers if they contact the Park Service or U.S. Forest Service prior to arriving (both agencies have jurisdiction). 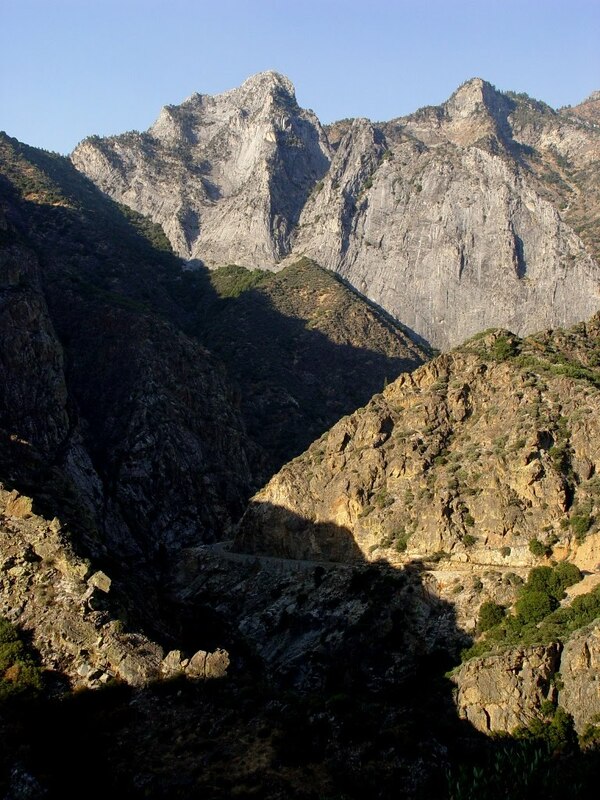 The Pacific Crest and John Muir Trails both pass through the monument. 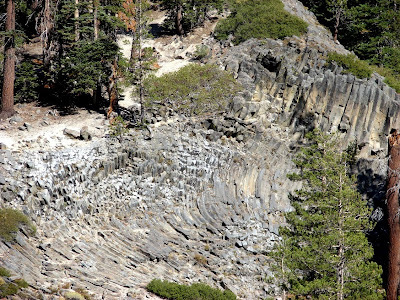 Some other very nice examples of columnar jointing can be found along Highway 108 over Sonora Pass (the Columns of the Giants), and in Yosemite National Park along the Tuolumne River near Glen Aulin. I am back home from a delightful field studies class with fifteen excellent students, having spent four days exploring the eastern Sierra Nevada, the Owens Valley and the White Mountains. It was strange to be so out of touch with cyber-space, but it was also so nice to be away from the normal craziness of school! Here are two shots from different angles of one of my new discoveries. A brownie point for explaining the origin of these rocks, and a few more for figuring out where they are, and the geological processes that have directly altered the outcrop. It's not that mysterious. If you think you know where it is, you are probably right! Ready to hit the road? 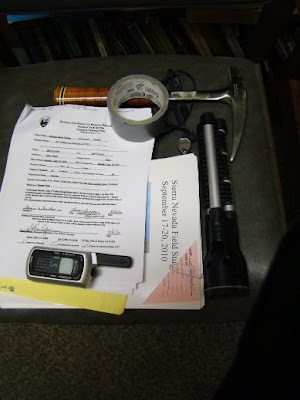 Lessee....rock hammer, check. Handlens, check. Flashlight, check. National park fee waiver, check. Radio, for waking sleeping students in other vans, check. Student torture worksheets, check. Duct tape for everything else that might go wrong, check. Students? Students?....Where are my students? It's Collect Rocks Day! Oh, How to Celebrate? Well, I think I shall take a group of college students to the eastern Sierra Nevada and Owens Valley, and see if there are any rocks there. This also means I will probably be without wi-fi access for...gasp....four days! So y'all hold down the fort while I am gone. I blogged about Collect Rocks Day a couple of years ago, and almost missed it, again. I had the privilege of traveling in wonderful exotic Hawaii last month, and this week I will be taking my students to the wonderful spectacular Sierra Nevada and Owens Valley, and in between these trips I daydream of not doing Program and Curriculum Review, and grading. I travel in my mind to those other places, wishing I was there. But sometimes, you get those couple of moments on the home turf that remind you that anyplace you live, that's where you are, and it has a geological story. I took a stroll the other evening along a river walk I didn't know our fair city had. I've been here for twenty years, and for most of that time, the town ignored the little treasure they had in the river. The river banks were occupied with a sewage treatment plant, a nursery with high fences, and various back lots of businesses who didn't allow access. When a huge new housing development went in (eh...just prior to the bursting of the housing bubble, of course), someone made a requirement that a river walk and park be constructed as part of the deal. The entrance of the park is so well hidden, it took me a couple of years to find it (it looks like an entrance to a private estate). The walk winds through some beautiful giant oak trees a few yards above the river. To my surprise, the park revealed some bedrock! Those who live in California's Great Valley are used to seeing dirt in their foundations, not rock. The town lies along a shallow channel carved by the Tuolumne that is just deep enough to reveal an exposure of Valley Springs formation, a volcanic ash layer dating to Miocene time. For a boring little farm town, it is interesting to think that at one time the region was in the path of a rhyolite caldera eruption from somewhere off to the east, maybe as far away as Nevada. Walking in the twilight among the ancient oak trees, I imagined the animals living along the river; the raccoons, the foxes, coyotes and feral cats. Saw a couple of them. In the growing darkness, it was a little easier to let the mind wander to an earlier time. Like back into the Ice Ages. In those days, the animals prowling the river were a little bit...different. A few years ago, a woman called saying she had found a piece of petrified wood along the river. I was quite skeptical, but took a look at what she had found, and my jaw dropped: it was a section of wooly mammoth tusk! Yup, these oak woodlands were once the stomping grounds of those incredible creatures, along with bison, horses, antelope, camels, giant ground sloths, short-faced bears (bigger than grizzlies), dire wolves, sabertooth cats, and American lions. 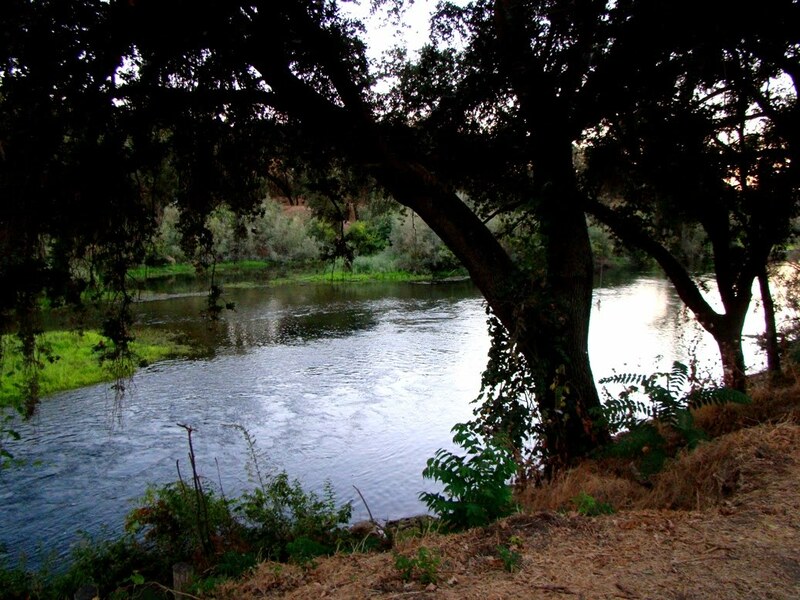 A quiet walk along the river at dusk would have been a dangerous and nerve-wracking affair 15,000 years ago! 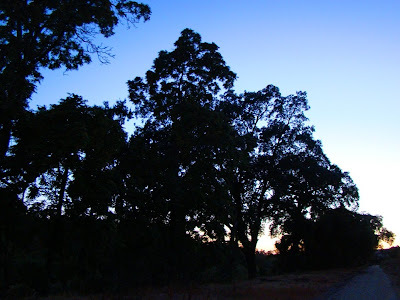 I sometimes think of my little town on the flatlands of the Central Valley as kind of boring place, even geologically. But sometimes, in the right frame of mind, I realize I need to tell Toto that I'm not in Kansas anymore. I'm in a special place*. You can tell when I have curriculum updates to complete. I can't complete a sentence that doesn't include "analyze", "classify", "assess", and other related terms. My normal conversation changes: "Look honey, we have bills, junkmail and postcards in the mail today. 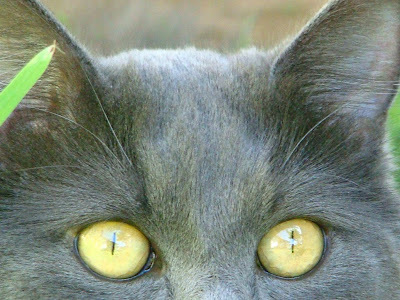 I am going to assess their relative merits, classifying and prioritizing each of them according economic importance, with an outcome that may include discarding, ignoring, or saving." Or to the dog, I might say "Angel, do you want to conduct a kinetic exercise, so as to observe and analyze recent visitors on our block using visual, auditory and olfactory evidence?" 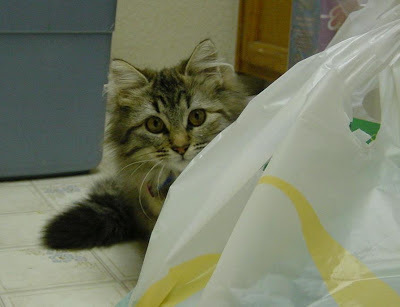 And I can't blog worth a darn...but here is a nice picture of a cat that we miss (not in the bad way; she moved out along with her "parents" headed to grad school). It's been a few weeks since I was enjoying a visit to the Hawaiian Islands, and school has begun in earnest, but I had a few more dispatches that I hoped to complete before academic matters overwhelm me. We've visited Pillbox Hill, stepped over molten lava, searched for native bird species, found invasive species, and explored two kipukas on the Big Island. 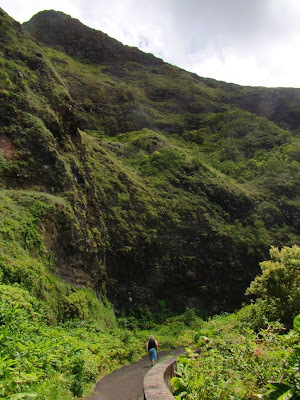 We explored one other trail, the Old Highway on the Nu'uanu Pali near Highway 61 where it passes through the Ko'olau Range between Honolulu and Kailua. It's a place of mysterious stories and tragic history. There's a movie and TV trope called the Fallacy of the Climbing Villain. In a chase scene, the person being chased has a choice of going downstairs or upstairs. They invariably choose to go up, which invariably leads to them to being trapped or plunging down to their deaths. It's a sign of weak scriptwriting skills most of the time. On the other hand, there are moments in real life when one has no choice. In the first years following European contact with the inhabitants of the Hawaiian Islands a momentous event was unfolding. For the first time in Hawaiian history the islands were being united under one king, Kamehameha I. This unification was not a voluntary exercise; the kings and chiefs on the various islands were not willing parties to the idea, and a series of violent invasions were needed to subdue each of the main islands (with the exception of Kaua'i. The king of Kaua'i got smart and acquiesced after seeing what happened to everyone else). On Oahu in 1795, things weren't going well for Kalanikūpule and his army. Kamehameha drove Kalanikūpule's soldiers up the Nu'uanu valley, and they soon found themselves trapped between the forces of the invader king and the 1,000 foot Nu'uanu Pali. A few tried to climb down, but more than 300 were driven over the edge, plunging to their deaths (hundreds of skulls were found at the base of the cliff during road construction in 1898). The remaining forces surrendered and the invasion of Oahu was complete. Plenty of other stories abound about mysterious beings around the Pali. There are tales of the goddess Pele (we heard one of them from our waitress at a restaurant in Kona) appearing as a woman hitchhiker. To this day, travelers on the highway carry gifts for the gods as they drive over the pass. In 1959, tunnels were bored through the cliffs to build a modern thoroughfare, and the old narrow Pali Highway was abandoned to the elements. It serves today as a trail that provides spectacular views of the Pali cliffs and the lowlands of the ancient Ko'olau caldera that now is covered by the towns of Kailua and Kane'ohe. 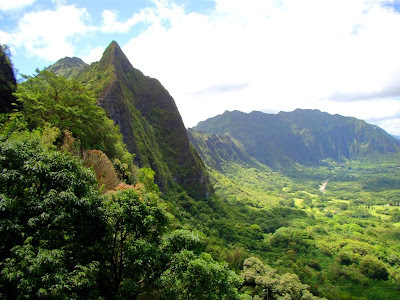 It's a wonderful stroll that provides a better view of the cliffs than the heavily visited Pali Overlook. It also turns out to be a pretty neat spot for birdwatching. 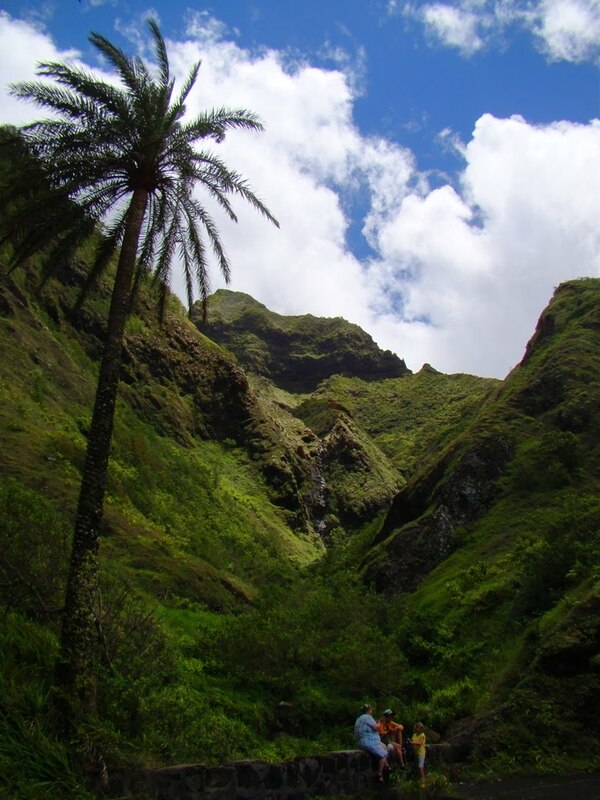 The Pali cliffs formed in part because of one of the giant landslides that have originated on the different Hawaiian islands, landslides that carried debris for dozens of miles out to sea, and caused massive tsunamis not seen or experienced in human history. I discussed one of these incredible events in this post. 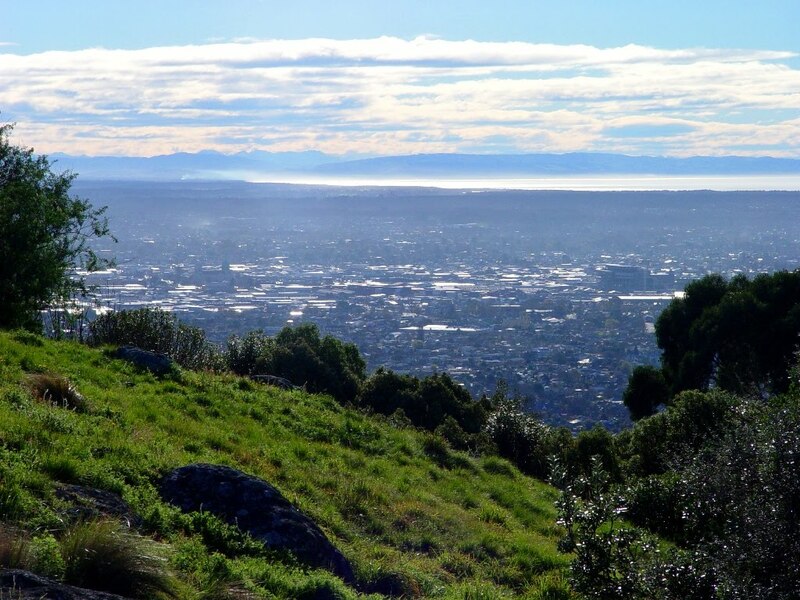 Christchurch, New Zealand Hit by Magnitude 7.0 Quake: Should Californians Pay Attention? What About God? A horrific aftershock of magnitude 6.3 struck the Christchurch area yesterday, and dozens of people have been killed. I am saddened by the loss of life and hope the best for the survivors. Some may be wondering why the damage is worse with a lesser aftershock. The quake yesterday was closer to Christchurch and more shallow. That alone can account for the great amount of damage, but building damage is also cumulative. Many of the buildings damaged in September had not been fixed or reinforced, and thus were subject to collapse with the newer quake. Please check here for up-to-date geological information. Not San Francisco Bay! 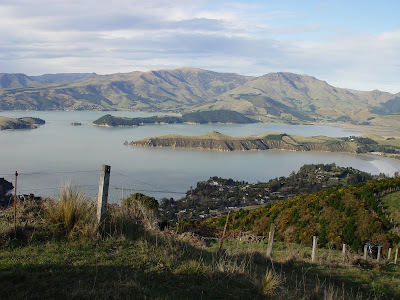 This is Lyttelton Harbour near Christchurch, New Zealand. If you are one of my local readers, you will be forgiven for thinking of California, where the San Andreas and many other active faults threaten a large population, and where memories of the 1989 Loma Prieta quake, the 1994 Northridge quake, the 2003 Paso Robles quake, and the 2010 Baja quake are still raw. But this year, we have seen other places where elements of the geology are similar, and where disastrous earthquakes have occurred. Last January, Haiti was devastated by a magnitude 7.0 quake on a strike-slip (horizontal movement) fault zone along a transform plate boundary in the Caribbean Sea, and yesterday Christchurch and other towns on the Canterbury Plain of the South Island of New Zealand were shaken by a magnitude 7.0 event. There are some chilling comparisons to be made between these events (and the 8.8 magnitude event in Chile last February). 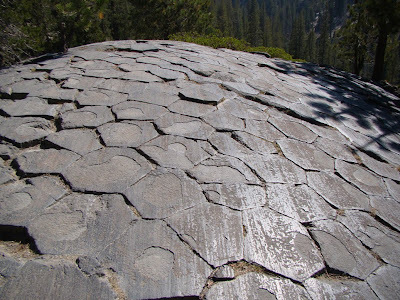 Chris at Highly Allochthonous has a nice review of the geological background of the earthquake. I was saddened to hear of the earthquake in Christchurch, and was relieved that there were so few casualties despite the widespread damage. I was privileged to visit there for all of 24 hours back in 2004, but I found it to be a pleasant town in a beautiful geologic setting. My prayers are with those in the region, because although few were injured, the population faces weeks or months of difficult times. Sewers and water lines, gas mains, and other types of infrastructure were severely affected by the shaking, and as many as 20% of homes are uninhabitable. There are some similarities between the South Island of New Zealand and California: The Alpine Fault is a large scale strike-slip fault system like the San Andreas, which is capable of producing large earthquakes in the range of magnitude 8 (a related fault on the North Island, near Napier, generated a 7.8 quake in 1931, killing 256 people). Like the San Andreas, a bigger quake is expected in the "near" future along the South Island stretch of the fault zone, the so-called "Big One". There are high mountain ranges, the Southern Alps, and the Kaikouras, that might remind some of the Sierra Nevada, although the geological circumstances are different. Some comparisons are more harrowing. The Baja quake this year and the one in Christchurch both involved few casualties, despite magnitudes of 7.2 and 7.0 respectively. Yet in Haiti, a 7.0 magnitude quake killed more than 200,000 people. Why? There are a number of factors: the Baja quake was in a lightly populated area, for one. But 500,000 people lived in the area affected by the New Zealand quake yesterday. One difference: the New Zealanders have a history of damaging quakes, and have high architectural standards. In Haiti, it had been 300 years since a large earthquake had taken place, and the country is so poor that they couldn't afford to enforce standards even if they had laws on the books. 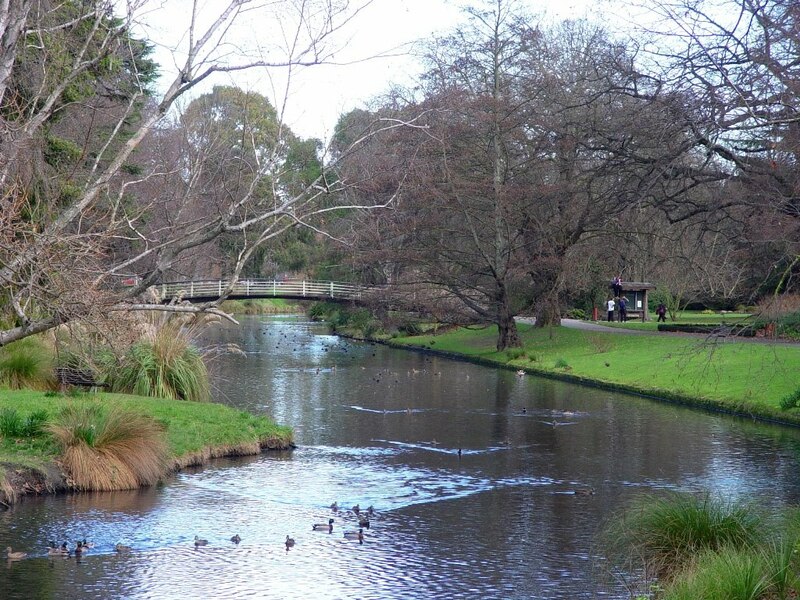 Another possibility may have saved a great many lives in New Zealand: the quake may have actually been a complex event involving three different quakes. The first quake may have been a 5.8 magnitude foreshock five seconds before the main shock. Five seconds is an eternity in an earthquake, enough to wake people to full consciousness, and enough time for them to make the right survival decision by taking shelter. It wasn't long before the word "miracle" popped up in relation to the earthquake in New Zealand. I have a real problem with the use of that word in relation to natural disasters. Miracles are invoked if hardly anyone was hurt, as if God (or the gods) were smiling on the folks where the earthquake was happening. But "miracle" is also a term used when rescuers reach a trapped person days after a quake when thousands of others are dead. What does that mean to the families of those who were killed? Why was one person "chosen"? When dealing with natural disasters, we really have to look at the fact that some societies have the resources and knowledge to protect their citizens, and others, whether from corruption or external economic factors, do not. If someone survives a disaster, it is often the result of planning, education, and available resources. Some of the most despicable people on this planet are the ones like the 'evangelist' Pat Robertson who are so quick to declare that natural disasters are the judgement of God upon people. Mr. Robertson rather stupidly declared that the Haiti earthquake happened because of a pact with the devil 200 some years ago. Why would anyone worship a god so capricious and inefficient that he waits 200 years to get around to punishing the children of the children of the children of the people who committed some kind of sin? Picking and choosing the reasons for a particular natural disaster in regards to the judgement of a deity is a dangerous and evil pathway that will someday come back on you. My religious and ethical beliefs speak of the equality and value of each human being on this planet, but our planet is not a very equal place. Sometimes, certain citizens of the richest countries have an arrogance and sense of entitlement that is not actually particularly deserved. Any of us could become a victim of a natural disaster at any time. Haiti is still in a desperate place; have you donated anything lately to help? Postscript: See this article in "Ask The Pilot" for a perspective on "miracles" in plane accidents. Postscript 2: An excellent post on the fault offsets on the Canterbury Plain, with maps and photos can be found here. Blogging is lighter this week and for the foreseeable future due to the fact that school has started again, and I have to learn the names of 150 new students, and start, like, uh, grading things again. I am actually quite happy to be working again. With appreciation to The Guzzler, take a look at a mudflow just south of Owens Lake on Highway 395 near the settlement of Dunmovin. There were some cloudbursts in the area last Thursday that caused some real problems, including a number of road closures. The video is from Jeff Bradshaw of Laguna Niguel. For my students who started school this week, this is close to where we are going on our field trip in a few weeks!